And so it goes; fear trumps reason for some perceived "greater good," but the effects on individuals can be harsh. It's especially frustrating to see such things happen in democracies that claim to value the concept "innocent until proven guilty" and then do the exact, hypocritical opposite. Those in power chose law over life rather than rethink their prejudices. A dog named Lennox was killed for no good reason in Northern Ireland on July 11. But it wasn't for lack of efforts to save him: his plight made international news and drew tens of thousands of supporters from around the world. Facebook and other social media sites besieged the Belfast City Council with petitions and appeals, including an offer of sanctuary in the United States. Yet in the end, the blind overruled the kind. All reason and fairness was shoved aside simply because a draconian U.K. law declares any dog designated as a "pit bull" to be inherently dangerous and therefore illegal to house. Never mind that Lennox never bit anyone and was never the subject of any legal allegations concerning his behavior. Never mind that he lived with a loving family and was a companion to a young girl. Never mind that a video of his temperament test shows him sitting patiently with his evaluators and being petted and fed by them. Despite being some sort of bulldog/Labrador mix, the local dog warden decided he was a "pit bull" because of how long his back legs were and how short his nose was. That's it. 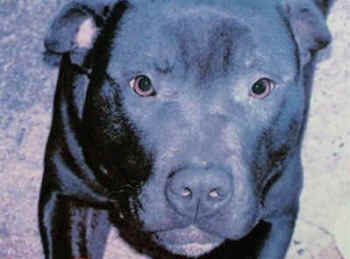 Lennox was a victim of breed-specific legislation of the worst order. "Pit bull" isn't even a real breed, but because he had "the look" of a type of dog many people assume is naturally dangerous, he was taken from his home and locked up for two years while his family and their supporters pleaded for him to be released or turned over to a rescue group and be rehomed somewhere legally. But neither the courts nor the Belfast government wanted to listen. Justice was indeed blind, but not in the impartial way. The authorities clung to an arbitrary definition of "danger" and refused to take the individual dog into account. The ASI policy paper "Dog Bites: Problems and Solutions" outlines how capricious BSL is. When you look at dog bite statistics, "pit bulls" are not overrepresented. And given that a mixed-breed dog's appearance often doesn't correlate with his or her actual pedigree (as studied in DNA tests of dogs in shelters), it's even more ludicrous to base policy on something so superficial. This type of thinking has some similarities with the now-infamous killing of U.S. teenager Trayvon Martin in Florida, who was targeted by an armed stranger who decided he was "up to no good" even though the boy had committed no crime and was going about his business peacefully. It's the same thought process (or lack thereof) that caused so many people to go ballistic when a group of Muslims wanted to build a community center in Lower Manhattan. After all, if all Muslims are potential terrorists, surely all "pit bulls" are potential maulers. It's a form of ethical blindness, but those of us who think with both our hearts and minds see it quite clearly for what it really is.